Makerere University has been hit by a new generation of youth coming from high schools and other parts of the world with a notorious background of drug addiction that later grows at the university. The high rates of drug abuse among the university students is according to experts, powered by a number of factors including, stress, and course load, peer pressure which is the most common, love and relationship problems among others. Joseph Muvunyi is a Makerere University student who spends his evenings at Caltec Academy sports ground sniffing petrol from a small bottle with his peers. In our interaction with these users, majority are Makerere University students and graduates. However, our reporter’s attention to drug addiction was caught by the number of girls within the group. Our reporter introduced himslef to them as a fellow addict seeking help. He was received by mixed reactions albeit from all willing to offer the help he wanted. Among them, Nantumbwe Shanitah, (not her real names) showed interest. Her cheeks were slightly sunken, making her cheekbones prominent. Her open neck-blouse exposed pointed shoulder blades, a sign that she was not feeding well. “Javix (the reporter’s nickname) you’re not alone, actually I take drugs and I am an addict,” she said without much prodding. “I cannot eat food nor do anything without taking the drugs.” Nantumbwe added. Nantumbwe, a third year student of Social Science, who lives in a single room at Kare hostel was introduced to drugs back in 2014 during her high school days by herpeers. She later joined Youth Alive group and temporarily dropped the vice. However, this was short-lived as she was re-introduced to drugs by her boyfriend during the vacation. She takes up to two or three bottles of cocaine mixture in a day, sometimes pouring a bottle or two inside a coke plastic bottle to deceive her friends who are not addicts.The habit has affected her relationship with men and she finds it difficult keeping steady relationships. We asked her whether she doesn’t feel embarrassed purchasing drugs herself. However, she said that, at first her boyfriend used to buy for her but later when the relationship ended, friends introduced her to drug suppliers. The other girls in the group are Claire and Linda, Claire is a 2014 graduate of Bachelor of Arts in Arts at Makerere University while Linda preferred anonymity. The two are addicted to “Shisha” smoke and they hangout every evening to bashes “Bufunda” in Bwaise’s Eden Pub and others around town. However, majority of these youth are Makerere University students while others are unemployed Makerere graduates. These students are addicted to different types of drugs including but not limited to Alcohol, Petrol, Tobacco, Cocaine mixture, Marijuana, Mairungi-narcotic drug leaf, shisha, among others. Some of these youth usually meet behind Caltec academy at the sports ground in Kikoni, despite the fact that this place is known to security operatives, nothing has been done to stop them. According to a source that preferred anonymity, “Abaho Jackson” a resident of Kansanga a Kampala suburb supplies Cocaine and Mairungi to different hostels in Kikoni and Wandegeya. 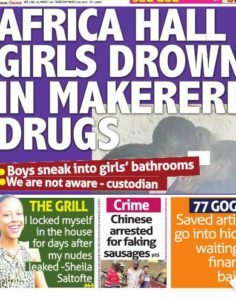 The story of Nantumbwe, Claire and Muvunyi, exemplify the serious drug addiction problem facing many students at Makerere University and within many other institutions. At the start of this investigation, the assumption was that the problem was unique to boys, but at the end of it, the conclusion was that the drug problem could be even worse among girls. 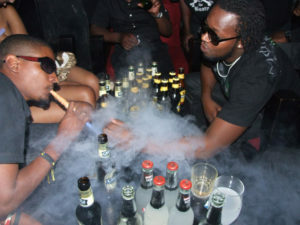 On 29, January this year, Kampala capital city authority –KCCA seized shisha, closed and arrested many shisha addicts, among them, majority were students from higher institutions of learning including Makerere University. On 2 February, 2018, our reporter visited Club Ambiance at Bakuuli where he saw young girls openly smoking Shisha and taking alcohol. According to Ainebyona Albert, a counselor at “Ask without Shame” an NGO, anyone suffering from drug abuse is no longer a normal person and is referred to as “suffering from significant loss of function” which manifests in the person’s behavior. “We often receive cases of drug abuse among youth and majorly university and college students, the government should put strict laws against drug dealers,” Ainebyona said. In 2015, Makerere University Council, introduced policies that require students to desist from masterminding or participating in strikes, sexual and drug abuse, use of vulgar language and indecent dressing.However, sections of the society strongly criticized the institution for introducing what they called policies that violate students’ rights though some sided with the administration. According to the then Vice Chancellor, Prof John Ddumba Ssentamu, the aim of the policies is to restore sanity at the country’s higher institution of learning so as to nurture good leaders. Ddumba said the university was not ready to revise the policies and that any student who fails to comply, would cease to be a student at Makerere, Daily Monitor reported in a story by John M Blanshe. However, the drug addiction vise is continuing to grow each and every day, but the government remains silent. The 2005 World Health Organization report ranked Uganda the leading consumer of alcohol in the world with a per capita consumption rate of 19.5 liters of alcohol per annum. Uganda was closely followed by Luxembourg at 17.54 liters and the Czech Republic at 16.21 liters. Therefore, it comes as no surprise to learn that more and more Ugandan university students are getting addicted to alcohol and other types of drugs.